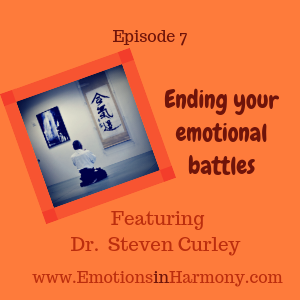 In this episode, Carmen interviews Dr. Steven Curley. Dr. Steven is Carmen’s Aikido Sensei. He has been practicing Aikido for 19 years and teaching for 9. He appreciates that Aikido is a spiritual path as well as a martial art. Dr. Steven is also a licensed psychologist who does Jungian and psychodynamic work in his private practice in Mountain View, California. He focuses mainly on growth with his clients, and highly values the process of in person therapy. He is here to share his wisdom about emotions, relationships, seeking help, and overcoming resistance. Please enjoy this episode of Emotions in Harmony. • The importance of being kind to yourself, because you’re not always going to get it right. • The value in starting with what’s in front of you and having some success with the less scary things before moving onto the scarier stuff down the track. • That it takes guts to go to therapy, but you’re not the first person to experience the fear • Why you don’t have to be perfect, you just must have the desire to begin. • What aikido can teach us about how to approach resistance. • Why it’s not about winning and losing, but about ending conflict.